Of course, it is the long bank holiday weekend and we had all but forgotten about it. We ready ourselves to get down at the next stop even though we know that we may have missed most of the day’s celebration considering the late evening hours, we are still willing to take a chance. As expected when we exit the tube station, all that we are greeted with are a handful of revellers and police officers on horsebacks manning the designated checkpoints. 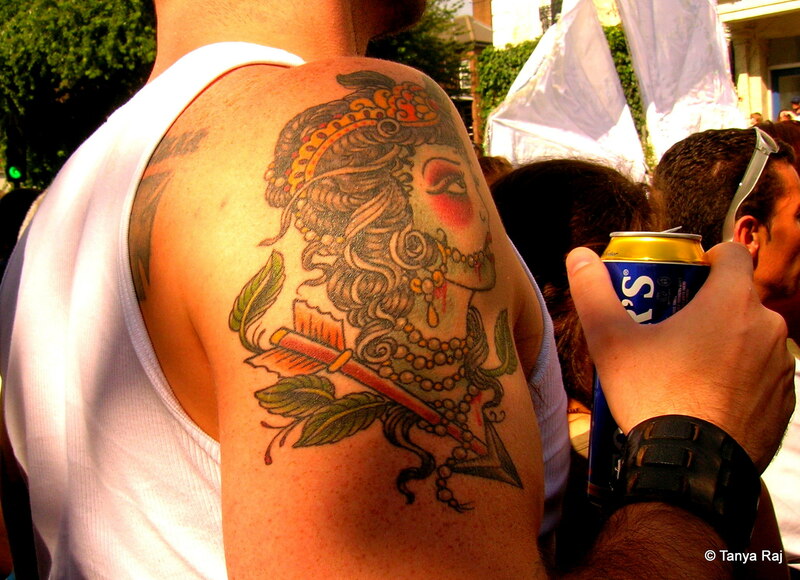 A flash of coloured Krishna tattoo captures my eyes. Disappointed but not disheartened, we return to the apartment resolved to return for the festivities the next day. The next morning weather is on our side with sun shining brightly and just the right amount of nip in the air, a welcome change from the dreary days that London is famous for. We take the Circle Line and disembark at Notting Hill Gate. It is only 9:30 in the morning but the revelries have already begun. 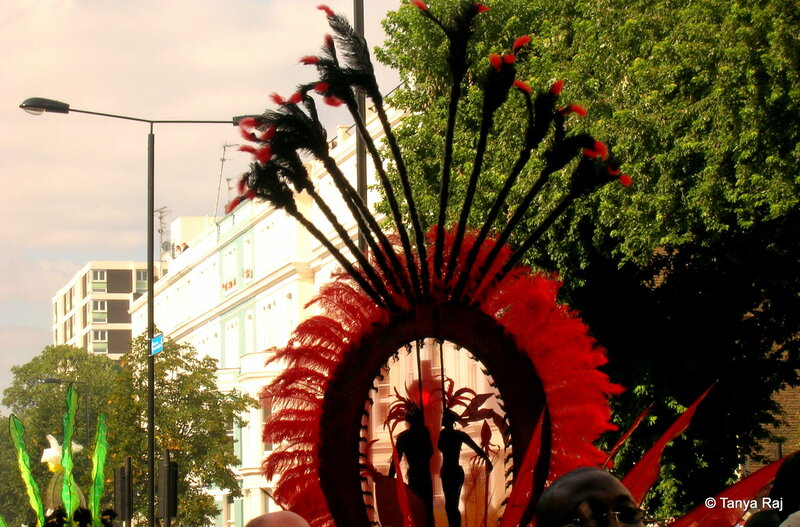 A circular red and black headdress towers above the crowd. 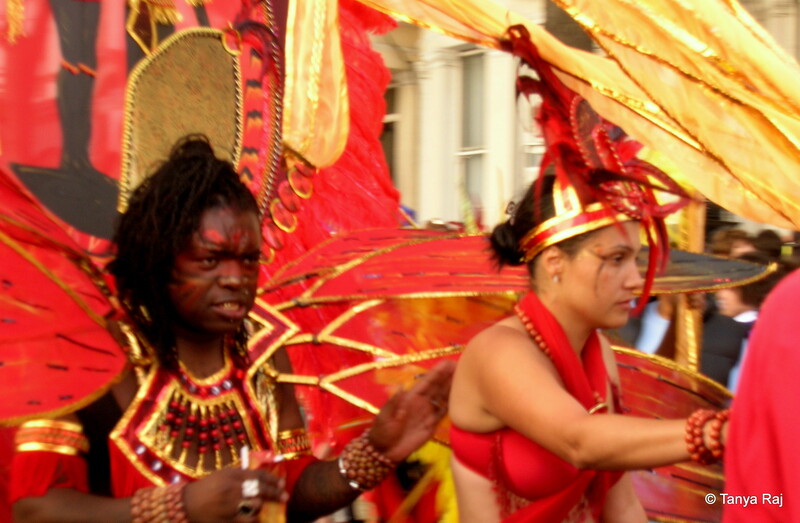 We follow the sounds of myriad music emanating from Portobello Road and immediately after taking the turn enter a world of colours, costumes, musical instruments, and food stalls. A sizzle of battered fish put into the fryer, mixed fragrance of sweet crispy banana crepes with maple syrup, a pop of red and pink balloon floats by, gaggle of laughter from the passing group of people, mic testing at the stage being set up, drum beats in the distance, cacophony of human voices, the atmosphere is a heady mix – enough to bring up the energy for the oncoming day. 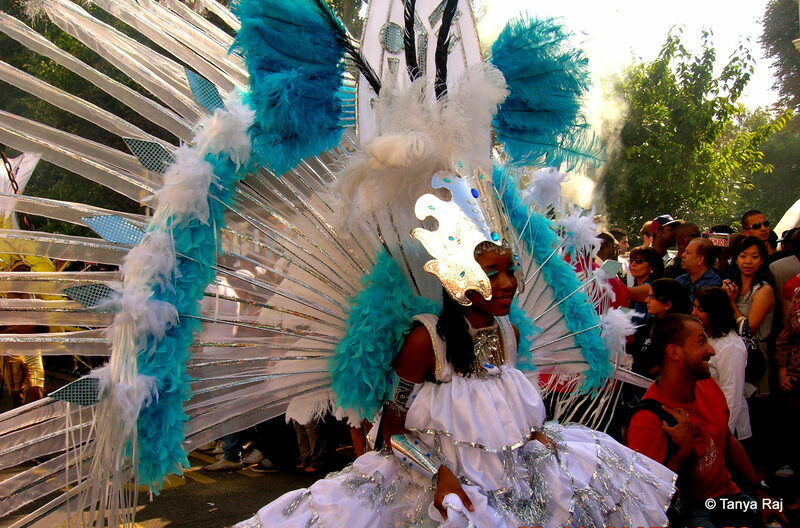 A shy young girl dressed in white and blue, with matching elaborate feathers and a crown. Straight ahead at the junction of Kensington Park Road, we are greeted with a sea of pink and among them elaborate feathered costumes of the parade in the centre. Right ahead of me I see a circular red and black headdress towering above the crowd. Grabbing my friend’s arm, I start making my way through the dense crowd towards the centre to get a better view. My eyes rest on a colourful Krishna tattoo on a man’s arm, I snap up a quick picture and keep moving to not lose momentum. A woman dressed in golden shorts, yellow belly dancing hip scarf with gold coins and lemon yellow feathered headdress is up next, followed by a large man dressed in white overalls, huge brown wings with Nelson Mandela’s face printed on it stretch from his back. A shy young girl dressed in white and blue, with matching elaborate feathers and a crown follows next. 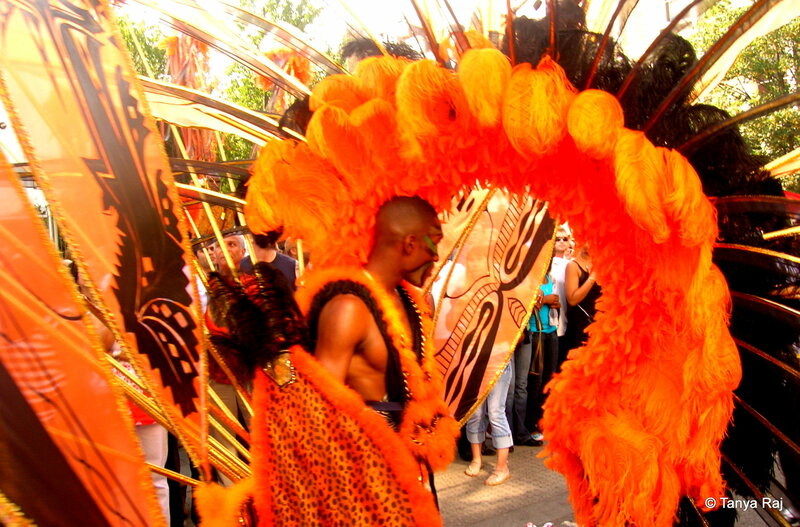 Bright orange and black headdress covers most of the next performer’s costume. One after the other they file out. The parade continues with colourful costumes. We start following the exodus towards Ladbroke Grove and finally arrive at the source of the drum beats that we have been following since last evening. For miles together, the entire avenue is filled with drummers – men wearing loose kaftans and women different versions of it in forms of halters and off-shoulders. Each one of them has a drum slung across their shoulder, drumsticks in both hands, and bodies moving to the rhythm. From my vantage point, it looks like a wave – ebbing and flowing to the beats of the music. The cobbled streets are filled from edge to edge and I curse myself for wearing heels. We find an empty set of stairs and I remove my footwear, choosing to walk barefoot. We start moving along with the parade and towards the middle come across a section leader of drummers. He starts by hopping to the beat towards the group in front – one, two, three, four – about twenty hops later, he spreads his arms in the air and starts swaying from side to side. I laugh aloud. The energy and tempo are picking up by the minute. We start walking ahead and come to the very beginning of the parade where three women are dancing, matching their steps to the beats of the drums behind them. From here, it is one unhindered view of the entire Ladbroke Road avenue and the coming together of this carnival that is supposed to Europe’s biggest open-air party. When the music died down and the day ended, I was left with a sore foot and a hungry tummy, but a happy heart and soul.